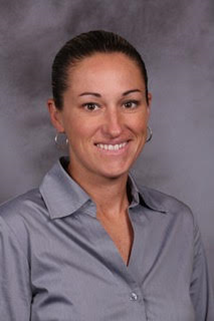 West was a three-sport star out of Franklin Academy High School in Malone in the mid 1990s, setting numerous records in basketball, softball and soccer. In basketball, she averaged 29 points per game and was named Miss Basketball in New York as a senior. She scored 2,605 points and helped her team to the New York State Public High School Athletic Association (NYSPHSAA) Section 10 title. In softball, she won 64 games and pitched 15 no-hitters and two perfect games and led her team to the New York state championship. She was selected Softball Player of the Year in New York and was chosen on the All-American team. She was a standout on the soccer field as well, scoring 63 goals and contributing 15 assists during her high school career. Missy played basketball at Duke University and was an integral member of the Blue Devils 1999 NCAA Women's Division I Basketball Championship team. She played professional basketball in Germany for three years winning a German National Championship both as a player and as a youth coach. She then began a 12-year stint of collegiate coaching at the Division III and II levels earning three conference coach of the year awards as well as the Eastern Region Coach of the year and was one of 8 nominees up for National Coach of the Year in 2013. She was inducted most recently in July to the National High School Hall of Fame in Providence, RI and presented the acceptance speech on behalf of all 11 inductees. She has also been inducted into the New York State Hall of Fame, The New York State Softball Hall of Fame, and the Franklin Academy Hall of Fame. She currently resides in Tampa, Florida and is a trainer for the Positive Coaching Alliance, a motivational speaker, NSCA personal trainer and has completed 2 full Ironman completions. She also enjoys the outdoors, spending time with friends and family and serving others with organizations such as Habitat for Humanity and The Boys and Girls Club. The North Country Sports Hall Of Fame is proud to welcome Missy as part of it's inaugural class.